GMD3150 TL comes in 10-foot width and will cut at 10 mph. 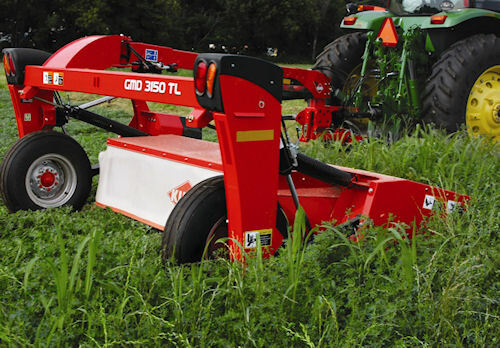 Kuhn North America, Inc., has added to its popular GMD mower line with a 10-foot, 2-inch GMD3150 TL model, designed to pull up to 10 miles per hour, and do so with very little maintenance. In addition, adjustments on the 3150 TL are simple and it provides for easy hook-and-go for easier starts to work. Like it's sister machines the GMD 3550 TL and GMD 4050 TL, the narrower machine has superior flotation and is very maneuverable in turns. The cutterbar on the GMD series machines is lubed for life, and the machines feature Optidisc cutters, with differential disc spacing for a clean cut even in challenging conditions. WN0411TA Simple adjustments and low maintenance are hallmarks of the new GMD 3150 trailed disc mower from Kuhn North America, Inc.
For more information on the new machine designed for smaller tractors, click on www.kuhnnorthamerica.com, or call (608) 897-2131.